Bottling has been the major activity in many wineries these past few months, an annual pre-harvest must. Preparation for bottling or crushing usually takes more time than the actual bottling or crushing. It all has to do with keeping everything — vessels, hands, filters, bottles, corks and hoses — that comes in contact with the wine clean. California’s harvest began two weeks ago with sparkling wine producers who always pick early for slightly under-ripe grapes. in 2017, over 4,000 wineries crushed 4 million tons of wine grapes. Oregon has also had several banner years. Its 474 wineries had 84,949 tons of Pinot Noir, Chardonnay and other grapes to ferment, rack, age and bottle. Washington state’s wine grape harvest is shaping up to be bigger than 2016’s record-breaking harvest of 270,000 tons. More than 940 wineries harvested 227,000 tons in 2017. A ton of wine will typically produce 768 bottles of wine. And, 270,000 tons equals almost 5 million bottles of Washington wine. An average American drinks 18 bottles a year. Fortunately, American wines are enjoyed by our friends Downunder, in Europe, Japan, China and Canada to name a few countries. Here are some wines, in no particular order, recently tasted. Going through my notes, I’ve picked out wines that I found particularly delightful. Some are still available, others you’ll just have to get the newer vintage. Beaucastel Chateau Neuf du Pape 2004 was on the bottom of the cellar and was out of sight for 10 years. It needed to be drunk now, I thought. But when I pulled the cork, aromas of cinnamon and Asian spices filled the air. And it was a gorgeous ruby color without a touch of orange. A beautiful wine with a lamb chop. And another from the cellar, Roberto Voerzio Vigna Serra 1990, vino da tavola della Lange, da una Nebbiolo e Barbera. The Nebbiolo Barbera blend was earthy and plummy with wonderful aromas. The critics say he makes age-worthy Barolos. This wine was beautiful at 18 years old. Luigi Righetti 1990 Capiteldella Roari Amarone della Valpolicella Classico is produced from Corvina, Molinara, and Rondinella. After harvest, the grapes are dried on wooden racks for five months before they are pressed and then aged in oak barrels. On the back label, I was informed that in 1990, Righetti produced 28,000 bottles of this Amarone. I thoroughly enjoyed No. 24081 with friends. Child’s Play Columbia Valley 2015 Zinfandel was made by Tendril Wine Cellars owner and winemaker Tony Rynders. This had a fantastic balance. Not a huge, jammy, high-alcohol type Zin but more in the early California style of a claret. The fruit and acidity balances the 14.2 percent ABV. Cairdeas Winery Diffraction 2016 Yakima Valley is a blend of 37 percent Syrah, 20 percent Grenache, and 17 percent Petite Sirah. The remainder is other traditional Rhone grapes: Mourvedre, Cinsault and Carignan. This one had earthy, chocolate, spice and plum aromas and flavors with Asian spices on a long finish. The Chehalem Willamette Valley Three Vineyard 2016 Pinot Gris also has fantastic balance. This certified sustainable winery in Newberg produced this wine in the French style, meaning it is not fruit-forward like a Pinot Grigio but rich with peach, lemon peel and spice. Like a Pinot Gris from Alsace, this wine is in a bottle similar to Riesling. Another great find this year was a bottle of Greystone 2014 California Petite Sirah. This wine caught my attention when I read Greystone and Petite Sirah. The back label said “cellared and bottled by Greystone Cellars.” Notice it didn’t say “produced by.” Only cellared and bottled. My guess is a negotiator bought some juice, made the wine and Greystone Cellars took it from there. Greystone is this massive building built by a businessman to house the Christian Brothers winery and to store wines from other wineries. When it was built in 1889, it was the largest stone winery in the world. Its cavernous tunnels held 3 million gallons of aging wine. Today, the building houses the Culinary Institute of America, which owns the building and the name. Joe to go Oregon Rosé wine is made in Oregon and is really good wine. Back label states that it’s Oregon Grapes, fermented in stainless steel, produced and packed (in a can) by Wine by Joe, Napa, California. Vinted and canned by Canned Oregon is a non-vintage Oregon Pink Rosé Bubbles that bursts with red berries, apples and a bit of spritz to make it refreshing. This is the ticket at the beach or after the long hike up the mountain. Canned Oregon hails from Dayton, Oregon, the heart of the Yamhill Carlton AVA. In this AVA are such heavyweights as Ken Wright Cellars, Lemelson Vineyards, Carlton Cellars, Soter Vineyards, Elk Cove Vineyards and Tendril Wine Cellars. What’s a rosé, anyway? Generally, it’s a category of wine – just like white, red, sparkling and dessert. It takes its name from the French word for pink and because the “e” has that little swoosh over it, it rhymes with Jose. Most rosés are made from red grapes. The aroma, color and tannic structure of a wine is in the grape skins. As a result, the color, flavor, and style of the rosé depends on three winemaking practices: the temperature throughout the winemaking process, the length of time the grape juice is in contact with the skins and how much residual sugar is in the finished wine. Rosé can be any shade of pink from barely perceptible to pale red. When using just red grapes, how long the grape juice macerates with the skins determines what shade of pink the finished wine will be. It’s similar to making a cup of tea, do you take the tea bag out after a brief dunk or do you dunk the tea bag, over and over and over? That continual dunking, whether tea bag or grape skins, extracts darker colors, more aromas, darker fruit flavor profiles and more acidity. Like Riesling, rosé wines can be made anywhere on the residual sugar spectrum. Fermentation happens when the yeast gorges itself on the grape sugars and burps up alcohol. Residual sugar is what the little yeasties haven’t eaten because, in the case of rosé, the winemaker stops the fermentation anywhere between 9% (sweet) and 13% (definitely drier) alcohol. Winemaking styles and consumer palates have changed since the heyday of Lancers and Mateus. Not all rosés are sweet. Just look to the center of the world’s rosé production, Provence, where they’ve been making dry rosés since Hector was a pup. Dry rosé is a staple in France. It’s consumed with lunch, brunch and dinner, on the patio, and decks, at the seaside, in the gardens, and practically every other occasion. As a matter of fact, French rosé outsells white wine in France. Long before most Americans became acquainted with rosés, there was white Zinfandel and pink Chablis. In the seventies, sweet fruity whites were the wine of choice. And then it happened, a tank of Zinfandel at Sutter Home got mixed up with a tank of white. White Zinfandel was a sweet pink mistake. In the USA, however, some still equate pink with sweet, possibly based on past encounters with blush wines from a jug with a handle on it. But those wines are behind us, dry rosé production is on the rise in France, Italy, USA and Spain. American wine drinkers are dumping the misconception that crisp, bright, and dry rosés are the same as sweet blush wines. There’s several ways to achieve that pretty pink color. 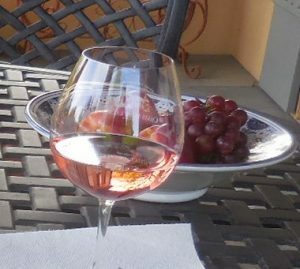 Everyday patio pinks are typically a blend of white wine with enough red wine in it to make it “blush.” Per bottle, this style of wine would contain five times as much residual sugar as a Provençal rosé. Another pink winemaking process is called, saingnée (sahng nee), another French term that translates to bleed. With this winemaking technique, the winemaker “bleeds” off the free-run juice from just barely crushed red grapes after momentary maceration. (No continual dunking!) The goal of saingnée is to produce a light pink wine with aromas and flavors similar to a red wine. Barnard Griffin’s Rosé of Sangiovese. Not too sweet, not too dry. A deeper colored wine with a lot of aroma, juicy acidity and flavors. A perfect patio wine. Others agree with me. Barnard Griffin Rosés have won eleven Best of Class and gold at prestigious wine competitions since its debut in 2002. Maryhill’s Columbia Valley Rosé Zinfandel is sourced from the award-winning Tudor Hills Vineyards. Grapes were hand-harvested during the cool hours of the morning to preserve the bright fruit notes and left on the skins overnight to extract color and then gently pressed. The free run juice was slowly fermented at 50ºF for a month. This wine is a crowd-pleaser and gold medal winner. Gerard Bertrand’s Rosé from the Languedoc DOC is a traditional Mediterranean blend of red grapes, Grenache, Cinsault and Syrah. It’s a beautiful pale pink and perfectly balanced with a dry, medium-bodied and yet fruity freshness. Its beauty extends to the bottle, designed by an art student. The old fashioned bottle shape has an artfully embossed rose where the punt is usually found and a glass stopper in place of the traditional cork. One winemaker I’ve been following for some time is Victor Palencia. His Vino la Monarcha Pinot Noir Rosé from the Ancient Lakes AVA is delicious. Yep, Pinot Noir from Quincy, Washington. Its floral aromas and flavors of citrus and minerality makes this one a refreshing patio pink. Stoller Family Estate Dundee Hills Pinot Noir Rosé is another winner. This wine is whole cluster pressed and fermented in stainless steel all at cool temperatures to preserve the aromatics and fresh red fruit flavors and mouthwatering acidity. The LEED gold certified winery has catacombs that draw in nighttime air, a natural cooling system! A favorite Spanish rosé from 40 year old vines in Campo de Borja is ZaZa made from Garnacha by Norrel Robertson, a Master of Wine. The must remained in contact with the skins for 24 to 48 hours, then free-run juice was bled, barrel fermented and aged sur lie for a month to integrate flavors, build mouthfeel, length and complexity. And it worked! The bright raspberry color and aroma give way to crisp raspberry and vanilla flavors and well-balanced acidity. It’s made for tapas, barbeque, salads, seafood and the patio. Dry, pale pink to a ravishing raspberry, they all have one thing in common. They are enormously refreshing, very hip and on the rise. While kicking around Whaling Days last weekend, listening to the music, catching up with some long lost friends, I was treated to a new Washington Winery. Well, new to me anyway. Wild Meadows Winery is part of the Precept Wine portfolio. Precept Wine is the largest privately owned wine company in the Northwest. Founded in 2003, Precept now owns 4,270 acres of vineyards, seven wineries and 37 labels in Washington, Oregon and Idaho. Last year, they produced 950,000 cases of wine including Waterbrook, Pendulum, St. Chapelle, Washington Hills, Sawtooth, Red Knot and Alder Ridge. Precept allows its wine makers free rein when it comes to making wine. 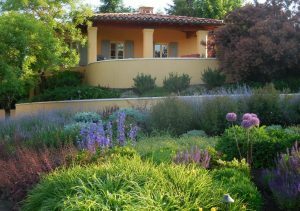 The Wild Meadow Winery winemaker, Hal Landvoigt, is also Precept Wine’s director of winemaking. This means he enjoys the freedom of choosing the best lots for Wild Meadow as well as House Wines, Washington Hills, Primarius, Battle Creek and Windy Bay. These wines are also attractively priced, usually under $12. Landvoigt was the mastermind behind the chocolate flavored red wine, Chocolate Shop, another Precept Wine brand. 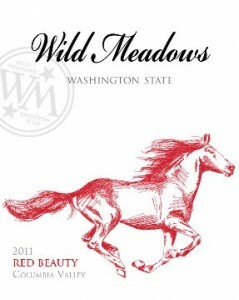 Wild Meadows makes a Chardonnay, Pinot Gris, Merlot, Syrah and Malbec. The juice is usually sourced from Columbia Valley since this is where the bulk of their vineyards are located. The white wine served was the 2012 Columbia Valley Chardonnay which sells for around $11. Aromas of apple, pear, and citrus follow thru on the palate. Served chilled, the flavors of apple and pear with a bright citrus note still come through. The red was called Red Beauty. It’s a blend of 45% Cabernet Sauvignon, 37% Merlot, 15% Syrah, and 3% Cabernet Franc. The deep garnet color was a promise of good flavors and aromas in the glass with berries, plums, cherries and big body with smooth tannins and a silky finish. Try them! You’ll like them! Taste Washington is today at the Centurylink Event Center from 2:00pm. until 5:00pm. This is your big chance for the whirlwind tour of some of Washington’s 780+ wineries big and small, old and new. Taste Washington is the nation’s largest single-region wine and food event. It features 225 winery booths and over 50 restaurant booths with delicious little bites interspersed among the wineries. In addition to the 225 wineries serving up at least three wines, there are regional sections where you can taste several wineries offerings from a specific area such as Woodinville, Yakima Valley’s Rattlesnake Hills, Prosser, etc. For the most part, these are smaller wineries that don’t have a booth like Cascade Cliffs and Efeste. And there is Taste the Vineyards. This area is organized by vineyard so you can compare and contrast the several different wines produced from one vineyard source. That is a real learning experience. The Oyster Bar is the place to go first with a full array of whites and pinks and Oysters! There’s a big line for the oysters but quick and personal service for the wines. Cote de Ciel’s Viognier was stunning. As was the Airfield Estate unoaked Chard and Arch Terrace Cherry Hill dry Riesling. Stop by Gorman Winery and Ask Chris why his delicious Pixie Syrah is 15% alcohol. I guarantee his answer will astound you. And stop by Palencia Winery for an amazing Albariño. Victor Palencia is the wine maker for Jones of Washington and is working two wineries, theirs and his. Kyra Winery has a dry Chenin (think Vouvray) that is 1.5% RS from 30 year old vines. V.G. They also make a very nice Dolcetto. La Crema Winery is really into cool. They have some of the coolest vineyards, Russian River, Carneros, Monterey, Sonoma Coast and Anderson Valley. All perfect places to grow those Burundian grapes of Chardonnay and Pinot Noir. They believe the wine is in the details. When grown in the cool climate vineyards, fruit develops wonderful aromatics and lush flavors with a crisp, firm structure. The Monterey appellation begins just north of the Monterey Bay and extends south to Paso Robles. This 90-mile-long valley is cooled by ocean winds. The cool climate, abundant sun, strong winds and low rainfall lower the yield, and provide extended hang time which makes for a concentrated flavors and aromas. Also ideal conditions for cultivating the bright acidity that’s the hallmark of a proper Pinot Noir. The 2012 vintage was a good one. The fruit ripened slowly, with good concentration and fruit character that can only come from extended hang time. It’s both savory and sweet, showcasing aromas and flavors of pomegranate and blackberry. Framed by sweet herbs and bright acidity, it’s juicy with smooth tannins, a perfect food wine. This is the wine when everyone is ordering a different entrée which may explain why it was voted Most Popular in a national restaurant poll. La Crema Monterey Pinot Noir sells for under $20. What a lovely start to the New Year! A friend dropped in for the annual open house and left without his hat. A few days later, I dropped by his house and reunited the hat and the head. But the best part was I dropped by at dinnertime. They invited me in for a glass of wine. And a little week night supper of fried rice to boot. But back to the wine… It was a Washington winery that I had never heard of and a grape they had never heard of – Idilico and Albariño respectively. Both were quite a surprise to me. I had no idea Washington was growing Albariño. Winemaker Javier Alfonso, a native of Spain, believes eastern Washington is much like the wine regions of Spain with dry, desert-like climate with hot days and chilly nights. He figures the climate in eastern Washington is very similar to the climate in northwestern Spain’s Rias Baixas wine region where Albariño originates. Finicky Albariño is a quality varietal but it’s low yielding. And its skins are thick so the pulp to skin ration is very different from other white grapes. This Albariño is from a 6 acre planting of in a cooler area of the Yakima Valley north of Prosser. The wine was fermented and aged sur lie in stainless steel for three months. The wine has the full spectrum of floral, almond and white peach aromas with the stone fruit flavors of apricots, peaches with a bit of citrus to make it really bright. Albariño has bracing acidity from those cool nights and should be consumed in its youth as it rarely ages. As you might imagine, production of these varietals in Washington is still very small. Their website charmingly explains, “We would like to apologize in advance if finding our wines proves to be difficult. In an attempt to help you locate the wines we will start giving updates via our Facebook Page which you can access below. Happy hunting! Elliott Bay Distributing distributes their wines in our area and the cost about $15. Enjoy! Long ago, my Aussie friend, Justine shared her wine buying philosophy – never buy a wine with an animal on the label. Ever. Llama is the name and the animal on the label of Belasco de Baquedano Winery’s Malbec. Nestled in the foothills of the Andes, this dark colored wine is from 100 year old vines. Its extracted color stained my glass, and that’s impressive. The intriguing aromas of black cherries and minerals had intense juicy cherry and blackberry flavors set off to perfection by the balancing acidity with a lush, smooth texture and hint of licorice on the finish. Practically all of the world’s Malbec is grown in Argentina. Successful Argentine growers know this French varietal produces inexpensive, delicious Malbecs from the higher elevation vineyards. Malbec used to be the favored Bordeaux blending grape but not so much anymore. France has less than 15,000 acres now with the bulk of those vineyards in the Sud Ouest – a ways from its roots in Bordeaux. Higher elevation than Bordeaux but nothing compared to Argentina’s high elevations. There is also a smattering of Malbec in Washington and California but if you total up the world’s Malbec vineyards, Argentina dominates. Malbec just plain loves the climate Mother Nature bestows on the Mendoza Valley. But Mendoza is vast, and that means different climates in the huge area can produce different flavors and aromas to the same grape variety. Some may have the dark fruit notes while a hundred miles away, more minerals and subdued fruit just like its cousin in Bordeaux. This fine wine sells for around $10 and worth every penny. Not too long ago, an old friend stopped by with a bottle of wine in hand. That put a smile on my face. And I was delighted to visit and taste this winery’s Syrah. I recalled that brothers Jerry and Butch Milbrandt were farmers first, the same as many wineries in Eastern Washington, having worked their family’s Columbia Valley farm for 50 some years growing row crops and orchards. Then in 1996, a couple of big wineries recruited the Millbrandts to grow grapes. They began planting vineyards in 1997. 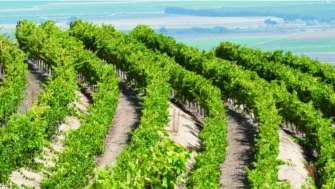 Today, Milbrandt Vineyards has more than 2,300 acres of grapevines; most of their estate vineyards are located in two AVAs in the Columbia Valley, Wahluke Slope AVA and Ancient Lakes AVA. The high quality of their fruit became so well known and in such demand, the Milbrandts were selling tons of their grapes to many Washington wineries. That was the impetus for building a custom crush facility in 2005. And then in 2007, they launched their own wines. The 29 acre Clifton Hill Vineyard in the Wahluke Slope AVA near Mattawa was planted to Cabernet, Cabernet Franc, Merlot, and Syrah in 1999. Now a fully mature vineyard, it produces an intense purple-black colored Syrah with a ton of black fruit flavors sprinkled with a hint of herbs and great balanced acidity. This is a big wine with surprising finesse. Expressive and classy, it has a wonderful long smooth finish. Distributed in Washington by Unique Distributing and sells for around $23. There is one good thing about this frigid weather we’re experiencing, the conditions are right for ice wines. These wines are a type of late-harvest wine that are made from grapes left on the vine far beyond the typical harvesting season. These grapes actually freeze before they are picked. Because the water in the grapes freezes and when pressed, the water crystals remain in the press. The results are highly concentrated flavors, rich colors and increased sugars. Ice wines almost always come in small (375 ml.) bottles and the price tag reflects the rarity of such wines.